The newly completed Little Fossil Linear Park will be hosting a grand opening and ribbon-cutting ceremony on Saturday, November 5, 2016 at 9:30 a.m. 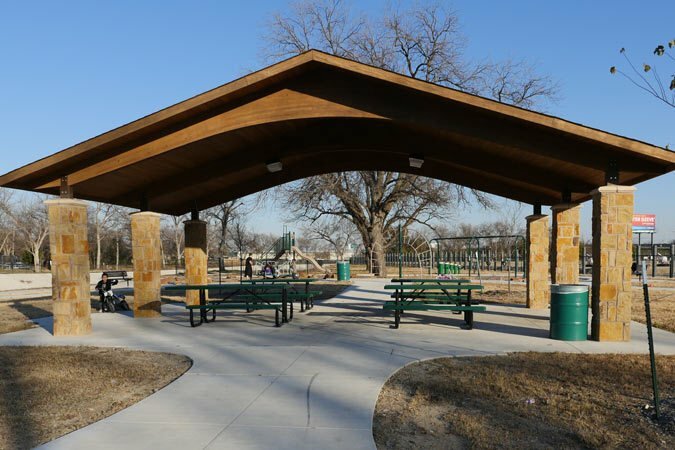 This 6.8 acre neighborhood park, located at 5713 Orval Court (mapped below), includes an almost-half-mile hike and bike trail, playground and picnic pavilion. Bring the family out to help us celebrate our newest park here in Haltom City. For more information, please contact the Recreation Center at 817-831-6464 or email Christi Pruitt. Join us for the grand opening of your new City Hall on May 13, 2016. Join us for a grand opening celebration at your new City Hall on May 13. The event will include an open house from 3 p.m. – 8 p.m. with a ribbon cutting ceremony starting at 6 p.m. on the plaza. Wear your walking shoes and plan plenty of time to see all areas of the building. A Sounds of Spring concert featuring Beatles tribute band “The Eggmen” will also be held in the City Hall Plaza starting at 7 p.m. Admission is free. Feel free to bring blankets or lawn chairs. A variety of gourmet food trucks will be on site or you are welcome to bring your own picnic, but please no glass containers. A premier shopping and dining destination for nearly two decades, Southlake will soon officially welcome its newest retail attraction, Park Village. The 186,000 square foot retail center, located at 1065 E. Southlake Boulevard, has been serving customers since last fall, but will celebrate its grand opening April 16, 5PM-8PM, with a free concert featuring the 1990s rock band, the Gin Blossoms. The outdoor shopping venue offers an assortment of shops and restaurants in a walkable setting. Owned by Excel Trust and managed by Lincoln Property Co., the center’s most unique feature is its eye-catching, illuminating, color changing fountain, a design inspired by the Bellagio Hotel in Las Vegas. Situated in a prime spot overlooking the intersection of Southlake Boulevard and Carroll Avenue, the fountain features coordinated lights and music and delights visitors with daily scheduled shows to several songs. The complex, which is already 83 percent leased, is anchored on the north end by tenants The Fresh Market, popular outdoor outfitters REI and Orvis, RA Sushi, Malai Kitchen, and the soon-to-debut Gloria’s Latin Cuisine, one of several sibling restaurants to the famous Dallas original. Michael’s, the arts and crafts super store, fitness shoes retailer Luke’s Locker, Beauty Brands and Potbelly Sandwich Shop prominently line the south end of the center. Other retailers to note include Modern Market, Gigi’s Cupcakes, Grayson Allen Fine Jewelers, The Juice Bar, Paper Source, Sur La Table, and the much talked about rustic pizzeria, Taverna Rossa, which will start serving hungry customers just in time for the center’s grand opening festivities. To celebrate its grand opening, Park Village will host Sip, Shop and Rock on Saturday, April 16. In addition to a free outdoor concert, the event includes food and beverage tastings, cooking demonstrations, and store giveaways with the purchase of a VIP ticket benefiting the Miracle League of Southlake, a nonprofit organization that provides opportunities for children with disabilities to play baseball. The Miracle League of Southlake was launched fall 2015 and served 152 young athletes on 12 teams. The program caters to young athletes from ages four to 28, and provides opportunities for disabled young people have fun, be active, and play baseball, many for the very first time. “The City of Southlake is a tremendous partner for the Miracle League, working with the league to build and help manage the Texas Rangers Miracle League Field within Southlake’s beautiful Bicentennial Park. This partnership involved cost sharing and the City was generous in providing matching funds for all donations designated for capital costs. It is through this partnership and support from the Mayor and City Council that the Miracle League was designated as the beneficiary of proceeds from the VIP event,” states Craig Rothmeier, president of the Miracle League of Southlake, also noting that the event proceeds will go towards increased expenses from an ever-growing league of athletes. Although Sip, Shop and Rock VIP tickets have sold out, the Miracle League of Southlake is still accepting donations. Sip, Shop and Rock hopefuls who did not purchase VIP tickets still have the chance to attend the free concert by the Gin Blossoms, known for hit songs Hey Jealousy, Found Out About You, Follow You Down and Till I Hear it From You. The band will perform from 7PM-8PM to cap off Park Village’s grand opening. Although admission to the concert is free, guests are required to register online to claim one of 2,000 available tickets. Limited parking for the event will be available onsite at Park Village. Overflow parking with a complimentary shuttle will be available at Dragon Stadium in Southlake. For more information, visit www.ShopParkVillage.com. Park Village fountain facing intersection of Southlake Blvd. and Carroll Ave. The press and public are invited to the grand opening of Blue Pomegranate Gallery on December 10, 2015 for an introduction to our unique brand of uplifting original artwork from American artists, with an emphasis on local art. This grand opening celebration event will take place at Blue Pomegranate Gallery, 1236 Prospect Street, Southlake, between 5:00pm and 9:00pm. Desserts and beverages will be available to all guests. Representing more than 100 local and national artists, sculptors and jewelers, Blue Pomegranate Gallery carries unique American handmade fine art, fine crafts, sculpture, jewelry, ornaments, wearables, garden art and gifts. Blue Pomegranate Gallery is open Monday through Saturday from 10:00am to 7:00pm and Sunday from 12:00pm to 5:00pm. Blue Pomegranate Gallery was founded in 2001 by two Nebraska artists. In 2009, one of those artists, Sondra Gerber, became sole owner and began to focus on quality, American handmade, original artwork and gifts that are created in the artists’ studios, with an emphasis on local and regional art. Over the past 15 years, Blue Pomegranate has continued to grow in notoriety, quality and sales in Omaha, Nebraska, where Gerber and her husband, Jason, call home. The Gerbers are excited to share their dream and vision of American handmade Fine Art and Gifts with Texas! The above press release was provided to My Southlake New via Blue Pomegranate Gallery.